This past week I reached a milestone that I though I never would reach. 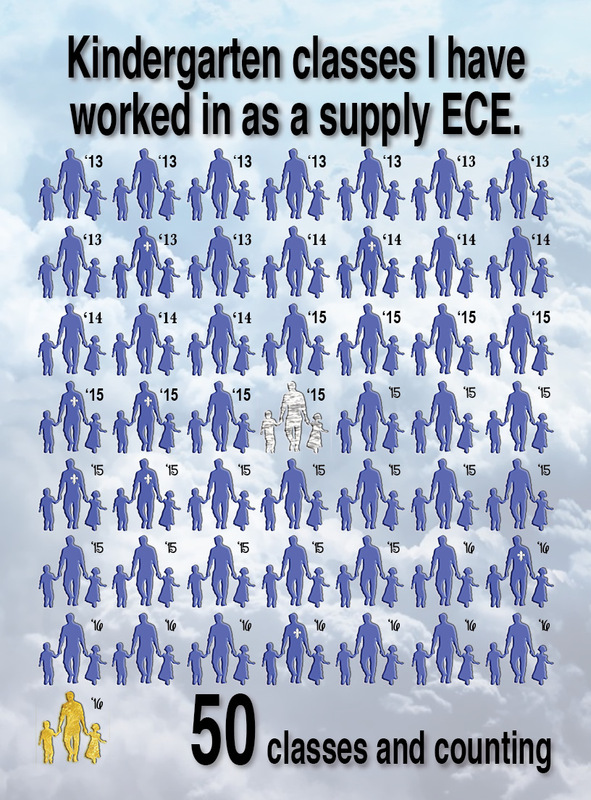 I worked in my 50th classroom as a supply early childhood educator (ECE) at the school board. I started in 2013 and since then, I have been in about 22 different schools and 50 different kindergarten classes. Over this time I have been in some classes that had the same teacher, but from year to year they had different students. The student’s personality differences change the dynamics in a classroom wherever I have worked with a similar teacher, therefore I see the class as a different classroom. In some cases I have been in 5 different kindergarten classrooms at the same school. I even have been in several French immersion classes during this time period. I have been keeping a count of the number of classrooms I have been in since someone asked me how many different classrooms I have been in, back in February. One surprising thing is that this past school year I have been in 25 different classrooms alone. Amazing, the first two years I was in 25 different classrooms but in this past one year I have equalled it. Mind you I did go to teacher’s college one of those years so that would make a difference in the number of classrooms I would be in. Yet reflecting back on the past year and the 25 classrooms, I can say with one thing for certain. Kids are kids no matter where you go. They are all very curious; they love to ask questions on topics of their interest and personal questions on your life. They all enjoyed my drawings and creative work with them and of course they loved George and my other puppets. Whenever I go back to a school or a classroom they always ask about George. But even though I have been in all these different classrooms it sometimes feel like a hollow victory. I look at this number and all the experience I have accumulated; yet I still am looking for a permanent position as a teacher of my own classroom. There are days when I feel like I am making progress and advancing in my career. Then there are days when the harsh reality of my situation sets in and you are only as good as your last job. The saying “It’s not what you have done for me that counts but what you have done for me lately”, comes to mind. On several occasions I have felt that no matter how good I do my job, I feel unappreciated. That for all my helping and hard work, to make a class and school that much more enjoyable for the students, it falls to the side like leaves falling in the autumn breeze. It feels like no one notices, no one cares. However those feelings pass as I try to be positive and think of the most important aspect of my journey into the different classrooms. My observation and learning from the different teachers and their teaching styles. I have observed many lesson plans and what is great is that I have been asked to conduct my own lessons in these classrooms. Lesson plans for math, language, art, technology and science to name a few. I even helped out a school with their science project on the life cycle of the butterfly. I don’t have my own classroom but it feels good to do some lesson plans to keep my teaching juices flowing. Below I have created a logo of a blue silhouette male teacher holding the hands of two students. Each of these silhouettes’ represents a different kindergarten class I worked in. I placed a number on the top right side that represents the year I was in that classroom. 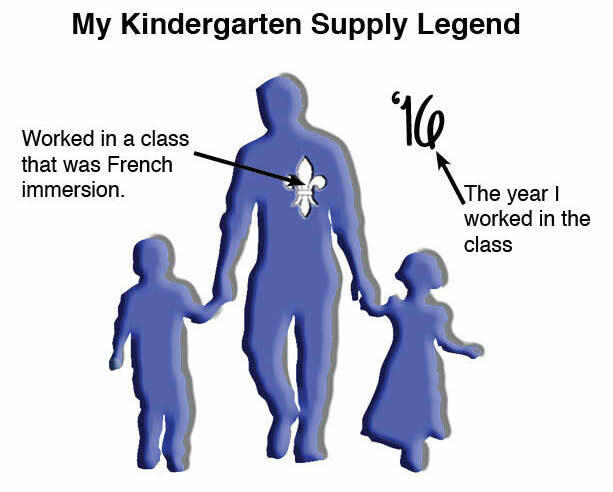 The classes that were French immersion are represented with a white fleur-de-li because the majority of the classes are English. Directly beneath the logo you can see a tally chart of all the classes I have been in. The 25th is shaded in silver and the 50th is in gold. Saying I have been in 50 different classrooms is pretty impressive. I have to remember to think of the positive side of my journey and remember those famous words written by Dr. Seuss. “Oh, the places you’ll go! I’ve already moved a few mountains, what’s few a more.